Want to improve your eyesight in an instant? That’s easily achievable with the Eight Diopter Clip On Magnifier from Hammacher, where the $129.99 that you fork out for it is a whole lot cheaper than getting a new pair of prescription glasses. These clip-ons will automatically deliver up to eight diopters of magnification, making it a whole lot more ideal for examining the finer details of stamps and coins, tying flies, or simply threading a needle. Apart from that, since they were specially made to be completely hands-free, you will find it a snap to magnify objects up to 2X from a range of 6-26″ away – of course, that depends upon the level of correction of eyeglasses worn where resolution of minute details are concerned. 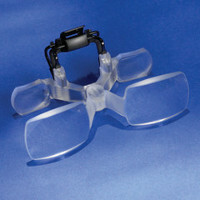 Capable of being adjusted up to five vertical positions for optimal alignment with most pairs of corrective eyewear, you can always flip them up in a similar manner to that of clip-on sunglasses when not in use. Each purchase comes with a protective zippered case for your added convenience.